Second place to visit according to my schedule was Budha Talab. After a fun-filled day at the Urja Park the previous day, the journey was becoming more interesting day by day. In the morning, all of us walked through the streets and did a little bit of shopping. We also bumped into some restaurants to much some spicy chaat. I remember visiting Raipur about 15 years ago, along with my parents. Nothing was so great or impressive about a small town in Madhya Pradesh. It was when I visited my maternal uncle, he was residing amidst the city and we had gone around the place and did a bit of shopping too. Traveling is now part of student life as well my hobby. I am happy to be back in Raipur after many years and today it is known to be one of the richest cities in India. I had a vague idea about the locations that I had visited as a kid. I remember a large lake popularly known as the Budha Talab. I knew that going there in the evening was more sensible. I rested in my hotel room for about two hours after the exciting shopping time and then began walking alongside the road and watching the buzzing city. It had changed tremendously. I kept sharing my previous experiences along with my friends. Today it is one of the leading business cities. It was almost 5pm, which was ideal for a visit to Budha Talab. I wanted to photograph the location before the sun sets. I hired a rickshaw, which dropped all of us right in front of the exotic location. Centrally located, it is one the major landmarks of Raipur. A colossal statue of Swami Vivekananda was I the middle of the lake. 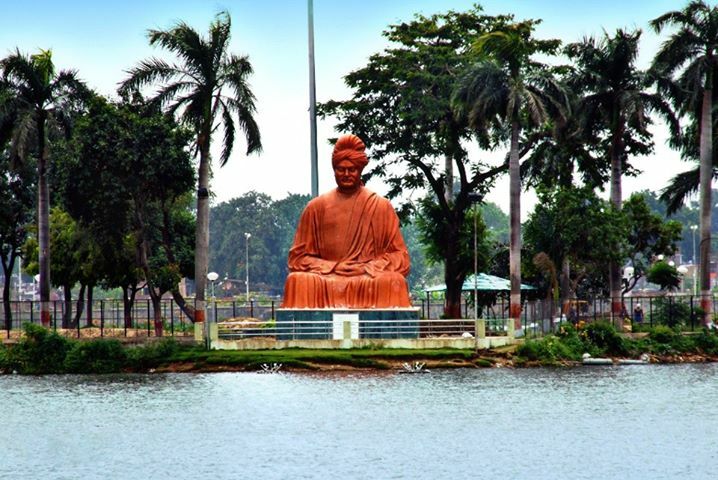 It holds the credit of being the largest statue in India and has a place in the Limca book of records… It is a tribute to the great personality, who had spent two years of his life in Raipur and use to be a frequent visitor to the lake. I also enjoyed the display of color fountains after the sunset. A great place to be!